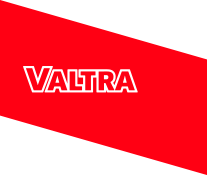 Valtra is a pioneer in tractor development. Many characteristics that were introduced by Volvo BM and Valmet have become industry standards. Safety cabs,driver ergonomics, turbo engines and a synchronised gearbox are examples of such innovations. But there are still many unique characteristics that you can only get with your Valtra. Because you decide yourself what your tractor should look like! Valtra offers the right cab for a range of different uses. A Series tractors are available with either an open or closed cab. The N and T series have an optional forest cab with a roof light that provides good visibility upwards. The SVC cab provides unrestricted visibility to the right-hand side and is excellent for mowing on slopes. For all-round visibility the forest and SVC cabs can also be combined to make an SVC 360. Valtra front-loaders are assembled on the plant’s assembly line. The loader fixings are fully adapted to the tractor and the loader is controlled from the cab with an ergonomically positioned joystick. Strong loader beams with welded seams on a double U-profile as well as the downward curved cross tube ensure good visibility. Valtra’s unique reverse drive system TwinTrac includes double controls with pedals and a steering wheel at the rear of the cab for work in the reverse driving direction. You can easily change working direction without leaving the driver’s seat. In the reverse driving position, you get an excellent overview of the implement and the work you are doing. Statistics prove the efficiency of working in reverse. TwinTrac not only improves the operator's ergonomics, but it allows for time savings of 10-30% in selected tasks. Valtra’s basic design with high ground clearance, a flat underside and a cab that is adapted for work with rear-mounted implements makes the tractors very suitable for work in forests. There are also numerous optional extras depending on the model: forest cab, protected fuel tank, narrow rear fenders, fixed rims, protected valves, diagonal or forest tyres and much more. AutoTraction automatically disengages the drive when the engines speed is under 1000 rpm or when the brakes are used at a speed of less than 10 km/h. When the accelerator pedal is used or the brake released the drive automatically re-engages. AutoTraction is useful in jobs that require repeated stopping and starting. The four-wheel drive engages automatically when starting off. Valtra also has long experience in manufacturing tractors equipped with ground speed. AutoTraction is a standard feature in the N Series and T Series. A turbine clutch is extremely useful for tasks that require precise manoeuvring of the tractor. It is particularly suitable for work with the front loader and forestry work. It also reduces the impact on the entire transmission. It is available for selected models in the N Series. Valtra LH Link allows the front linkage to turn in the desired amount with the front wheels, making it easy to mow or sweep around corners without missing anything. The pivoting of the front linkage can be controlled either manually or automatically – for mowing tasks the automatic option is superior. With Valtra EcoPower models tractor operators have the unique opportunity to choose between two different engine settings at the push of a button. Valtra EcoPower models offer two tractors in one. By activating the EcoPower function, the maximum engine rpm is lowered to 1800 and the engine torque increases. At the same time, the average piston speed is reduced by 20 percent. This not only reduces the engine noise and improves the driver's comfort. It also means fuel savings of up to 10 percent and an increased engine lifespan. EcoPower is available on selected models in the T Series. EcoSpeed is especially suitable for countries with a speed limit of 40 km/h for tractors. EcoSpeed is based on the 50-km/h transmission, but the highest speed is limited to 40 km/h. As the maximum speed is achieved in EcoSpeed tractors at a low engine speed of just 1800 rpm, and lots of driving is done at this speed, considerable advantages are created. EcoSpeed is available with selected models in the T Series. The Sigma Power feature gives extra power for PTO work. When required for PTO work, the engine will automatically produce up to 30 hp more power. This automatism is based on measurements collected on the PTO driveline. Sigma Power is especially suitable for work with implements that demand a lot of PTO power, such as choppers, round balers and rotary cultivators. Sigma Power is available on selected models in the T Series. The Aires front axle suspension adds driving comfort and work productivity. The system uses compressed air, which makes the suspension also suitable for cold temperatures. In transport driving the air suspension makes keeping control of the tractor easier. In fieldwork the suspension improves pulling power as the wheels remain in contact with the ground. The compressed air system also allows for the usage of compressed air for other purposes. Aires is available for the T Series. Valtra's forward/reverse shuttle is widely recognised as the best on the market. The driver selects the direction of travel by moving the lever forwards or backwards. The handbrake is integrated into the selector lever.